When purchasing a greenhouse, a gardener is faced with a few options in regard to the type of material the transparent panels are made from. Although all greenhouses are designed to allow sunlight to reach the plants, there can be a difference in the way a garden performs due to the materials that make up the greenhouse. Hobbyists looking to set up a greenhouse have essentially three choices when it comes to the greenhouse’s glazing options: single pane glass, double pane glass, or multi-wall polycarbonate. Each glazing option has its own advantages and disadvantages which means growers should examine each before making a final decision. The older-style single pane glass greenhouses with overlapping glass are less than desirable due to the fact that many of them are not adequately sealed. This can cause a series of problems including inefficiencies with heating and cooling and humidity/moisture problems. The good news is that most of the newer-style single pane glass greenhouses have full length glass panels and are sealed which solves many of the problems associated with the outdated, leaky designs. One great thing about single pane greenhouses is that they look fantastic. Single pane glass greenhouses are very aesthetically pleasing and will only cost a little more than a polycarbonate greenhouse. However, single pane greenhouses should probably be avoided by gardeners in northern climates. Single pane glass greenhouses are the least energy efficient type of greenhouse. In fact, a single pane greenhouse will have double or even triple the heating costs when compared to a double pane or multi-walled polycarbonate greenhouse. Single pane glass greenhouses allow for 92% light transmission. 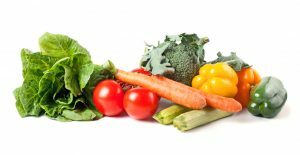 This can be an advantage or a disadvantage depending on your climate and the location of the greenhouse. Greenhouses should let in as much sun as possible, right? In some cases, a glass greenhouse can allow too much light to reach the plants which may create “hot-spots” and cause significant damage to the plants. The gardener may need to install a shade cloth in the greenhouse to rectify this problem. All in all, single pane glass greenhouses are a good choice for gardeners who will not be heating the greenhouse or who strongly desire an aesthetically pleasing greenhouse. Double pane glass greenhouses are the bee’s knees when it comes to greenhouses. Double pane glass greenhouses are designed to be the most energy efficient and offer gardeners half the heating costs associated with single pane glass greenhouses. In other words, gardeners can look at a double pane glass greenhouse as a long term investment that will pay for itself in the form of energy savings. Double pane glass can also include a special low-e reflective coating on the inner pane of glass which reflects heat and acts as an insulator. For a serious hobbyist searching for the nicest looking and most energy efficient greenhouse, a double pane glass greenhouse is for you. The only real disadvantage of a double pane glass greenhouse is the initial cost. Double pane glass greenhouses are by far the most expensive option but, again, when examining the long term energy savings, the increased initial cost of the greenhouse would be paid back over time. 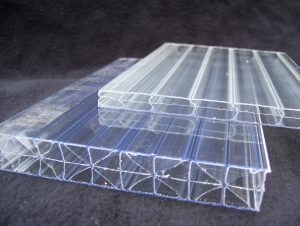 Another glazing option for a hobbyist looking to set up a greenhouse is polycarbonate. Multi-wall polycarbonate greenhouse material comes in a variety of thicknesses (8mm triplewall, 16mm 5-wall). The construction of the material varies slightly but all include multiple walls inside of the material which form channels that hold air. This airspace is important because it creates insulation value. A polycarbonate greenhouse offers similar energy efficiency to a double pane glass greenhouse. One advantage of polycarbonate material is that it naturally diffuses the sunlight. By diffusing the sunlight, polycarbonate greenhouses reduce the likelihood of “hotspots” and give the plants in the greenhouse an even distribution of light energy. Polycarbonate panels that are slightly tinted can also be installed in the roof of the greenhouse to reduce or eliminate the need for shade cloth. This is a great option for gardeners in hot, sunny locations. Although polycarbonate is not as aesthetically pleasing as glass, these greenhouses offer the best upfront value. Polycarbonate can also be used to retrofit older greenhouses to increase efficiency. Please remember when making a decision regarding your greenhouse glazing options that efficiency and greenhouse performance are dependent on many factors including your geographical location and the orientation of the greenhouse. Where you live and what you grow will make a big difference in your selection of a greenhouse and greenhouse glazing. 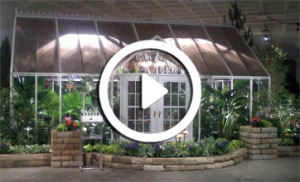 Take the time to explore all of your options to find the greenhouse design that will best serve your purposes.